I would like to direct your attention to the Facebook page @Missouri Bicentennial Paint For A Cause. 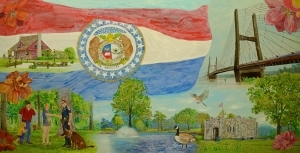 Barb Bailey and I have been endorsed by the Missouri 2021 commission to do a large 12 ft X 30 ft. ‘Paint For A Cause’ painting for the Missouri bicentennial celebration. The celebration will take place on or near August 10, 2021. Barb and I (along with a few assistants) will take 4ft X 6ft sections of the large painting to art related events in 15 cities across the state. This will be a 2 1/2 year process that has already begun. People of all ages are invited to participate by painting on the predesigned aluminum composite sections. Participation is free for the public. Promotion, sponsorship and monetary donations are welcomed. Anyone who would like to assist us in any way will be welcome and may be able to reach me (Aaron) at 573-579-1000.